← Quote 2 of ? Every now and then, I’ll wander down to the hall to Connor’s office. Connor manages to be an unimposing guy despite his 6’4″ stature and linebacker form. The first thing you see when you walk into his office is a gloriously teetering stack of books in all shapes and sizes. Contained in those stacks are books of every genre: history, pop fiction, self help, business, and just about everything else you could want. He’s read it all — and when I say read I mean really read — the prodigious highlighting and notes in the margin profess his meticulous nature and critical insights. And, boy, does Gates of Fire ever get the testosterone pumping. I’ve read my fair share of bloody literary battles, but Gates of Fire is the first one that decided that entire paragraphs should be devoted to describing the depth of the rivers of blood and other bodily fluids (that I will not mention here). It rather reminded me of Tolkien’s penchant for taking pages to describe scenery, except with a grisly turn. 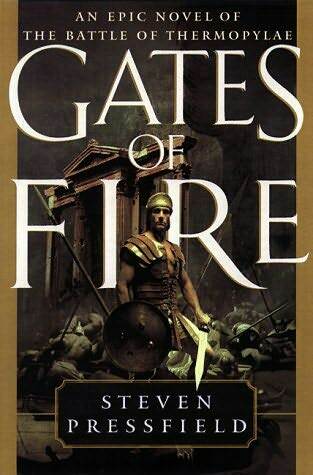 Regardless, Gates of Fire is an interesting book because of its interpretation of the famous Battle of Thermopylae — battle that took place in 480 BC between Sparta and its various allies and the Persian Empire. As someone who enjoyed the movie 300, I enjoyed learning more about Sparta — and Greeks in general — but found the book to be underwhelming overall. Connor informed me that the book is usually required reading for the various branches of our armed forces. Reading through the book, you do get a sense that it is glorifying everything that they hold most dear – loyalty, glory, bravery, selflessness in giving everything to your country, discipline, etc. However, I found it almost impossible to connect with the characters in the book. The conversations, despite their profound nature, often felt forced and superficial. Overall, I would steer clear of the book unless you have a profound interest in Sparta. It’s not that the novel is a bad one, I just believe there are better literary works to be found. Do yourself a favor and skip the book, read the Wikipedia article on the Battle, and watch 300 again. You’ll get the same effect. I am very interested in how one relaxes and pumps testosterone at the same time. Connor must be quite the multitasker.